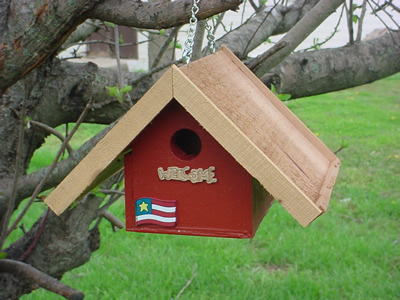 Dimensions 5 3/4" x 6" x 7 3/4"
Screw eye option includes 2 screw eyes installed in the roof of the house (as shown) which allows you to hang in a tree or under the eave of a house. Post mount option includes a 6" extension from the back which will allow mounting of the house on a fence post or flat mount against a structure. indicates that this product is custom hand crafted at time of order.